Michael was shocked when he received a call from Corporate wanting him to interview for a position. Michael was happy, but he also had other things on his mind. Beach Day was coming up and he was taking the crew out for some fun in the sun. Not before reminding Toby he couldn't go because somebody had to stay in the office. Michael put Pam in charge of keeping notes on who expressed great managerial skills, in case Michael was to leave the Scranton Branch and needed to choose a successor. When the staff arrived to the beach, Michael surprised them all with the news that they would be broken down into four tribes and be competing in battles. 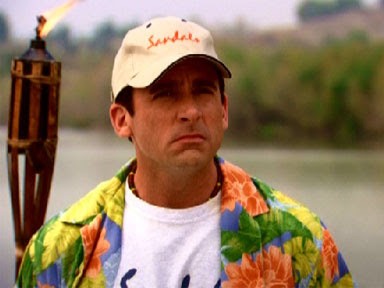 Michael assigned Dwight, Stanley, Jim, and Andy as tribal leaders. He sidelined Pam from participating because she had to concentrate on taking notes. 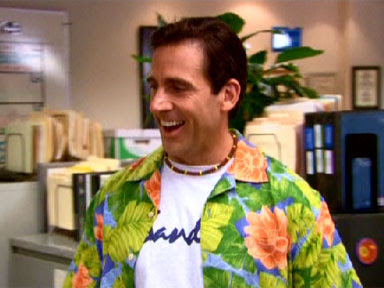 In reality, Michael was using this competition as a way to decide who his replacement would be if he moved to Corporate. Pam sadly watched as her co-workers were playing the beach games. Michael later put her in charge of grilling hundreds of hotdogs for another battle, a hot dog eating competition! When people complained, Michael shouted that the winner would win his job and his salary and his Chrysler Sebring! After sumo wrestling in inflated costumes, Andy went to the lake and accidentally fell in. He was floating away and Angela ignored his cries for help. She was sabotaging his efforts while falling in love with the idea of Dwight taking over the Scranton Branch. Michael's next challenge involved the teams walking on burning coals. Pam stepped up to the plate to take the challenge. Michael stopped her and told she couldn't because she had to continue to take notes. Meanwhile, Andy was still unaccounted for, but managed to wash up into some brush along the lake's far shore. 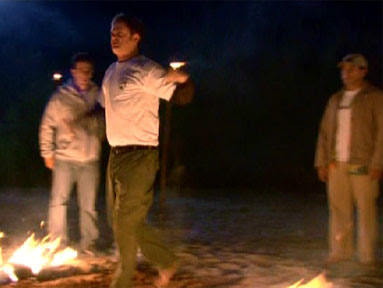 Michael chickened out before walking on hot coals. Dwight completed the challenge, only to be turned down for Regional Manager. Jim was chosen. Jim alerted Michael that he also applied for the job at Corporate, as did Karen. 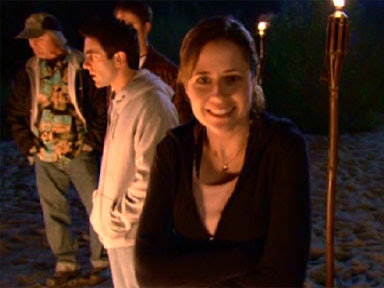 As Michael and others were busy arguing, Pam walked across the hot coals. She felt a rush of bravery after she was done and begin telling the staff what was really on her mind. She turned to Michael and told him she did accomplishe the coal walk and he didn't, therefore maybe she should be Regional Manager, then she asked the staff where they were during her art show months earlier. 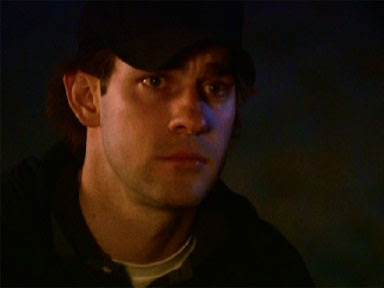 Pam suddenly turned to Jim and said he was the reason she called off her wedding and he should stop acting so weird around her. She missed their friendship and missed having fun with him. She then left to relieve her feet in the lake. Michael thought her speech was amazing, but was still looking for someone with a sales background. Labels: #323 - "Beach Games"